Special recognition for Professor Adrian Cheok, Professor of Pervasive Computing in the Department of Computer Science. 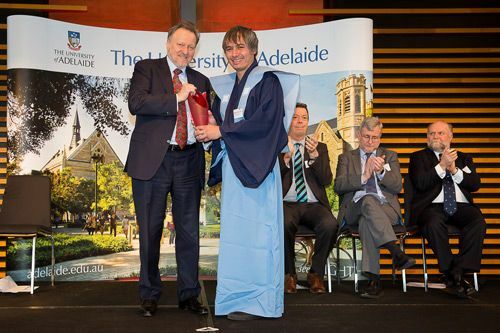 Professor Adrian Cheok, Professor of Pervasive Computing in City, University of London's Department of Computer Science, received a Distinguished Alumni Award from his alma mater, the University of Adelaide, South Australia, on 9th September. The Award is “in recognition of alumni who have enhanced the reputation of the University through outstanding service to the community or who have made an outstanding contribution in their chosen fields." The Awards were established in 1991 by the trustees of the former Alumni Association and are now administered by the Alumni Office. Professor Cheok obtained a First Class Honours Bachelor of Engineering degree in 1994 and completed his PhD in Engineering in 1999. He has been a pioneer in mixed reality and multisensory communication and his innovation and leadership has been recognised internationally through multiple awards. He was presented with his Award by Professor Warren Bebbington, Vice-Chancellor and President of the University of Adelaide. Professor Cheok joined City, University of London as a Professor of Pervasive Computing in 2013. He is also the Director of the Imagineering Institute in Iskandar, Malaysia. Some of his pioneering works in mixed reality include innovative and interactive games such as ‘3dlive’, ‘Human Pacman’ and ‘Huggy Pajama’. Professor Cheok is also the inventor of the world's first electric and thermal taste machine, which produces virtual tastes with electric current and thermal energy.